ST. GEORGE — A search for a stolen gun led St. George police to arrest two St. George residents on felony drug and burglary charges just past midnight Sunday. According to a probable cause statement, a St. George man flagged down St. George Police Officer Stan Thompson on Saturday afternoon and reported that his firearm had been stolen from his St. George home. The man stated that a female friend had stolen a handgun from him and that her friend, later identified as Jordan Cydnee Larson, 26, had then pawned it, which Larson later admitted to police. Police officers responded to Larson’s house, located at 376 E. 300 South in St. George, where Scott Harris Larson, 23, also resides. Inside the Larsons’ home, police officers found two pawn receipts with Jordan Larson’s name on them, numerous stolen items, heroin, and drug paraphernalia. 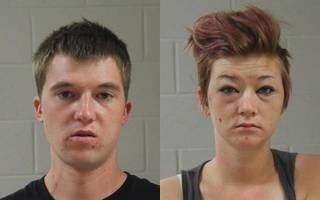 Jordan Larson and Scott Larson both admitted that the heroin and paraphernalia belonged to them. During the investigation, Scott Larson erased several text messages in an attempt to hinder officers, according to the statement. The estimated value of the stolen property was around $1,020. Jordan Larson and Scott Larson were arrested and booked into Washington County’s Purgatory Correctional Facility. Jordan Larson was charged with one second-degree felony for burglary of a dwelling, one second-degree felony for theft of a firearm, one class-A misdemeanor for theft, one second-degree felony for possession of heroin in a drug-free zone, one class-A misdemeanor for possession of paraphernalia and two class-B misdemeanors for theft by deception and an outstanding warrant. According to bookings information, her bail stands at $35,052. Scott Larson was charged with one second-degree felony burglary of a dwelling, one second-degree felony for theft of a firearm, one class-A misdemeanor for theft, two class-B misdemeanors for theft by deception, one class-A misdemeanor for possession of paraphernalia, one second-degree felony for possession of heroin in a drug-free zone and one third-degree felony for obstruction of justice and a warrant. According to bookings information, his bail stands at $40,052. These are the real people of Dixie, UTAH. Yep. They’s be from Dixie, uh huh! Yeah…fine, upstanding, pillars of the community folks. Keep them out of my neighborhood. Actually, they “are” in your neighborhood. You just don’t know it yet. Heroin use and prescription Opiate abuse is becoming an epidemic in this area. Folks from 15-50 are struggling with this addiction all over this county. Not sure what the solution for this problem is. Sounds like the “female friend” should be in trouble also..
WOW she’s a looker!!! Hahaha yikes! What a lovely couple. I am so glad they found each other. But, I have a question and hopefully someone can answer it. Isn’t the Pawn Shop required to check the legality of all guns that they purchase? Considering it was a stolen firearm, I doubt this little Bonnie-n-Clyde wannabes had any type of paperwork for the gun. …, the courts are a joke! The just postpone and stretch it out and slap their hands! PUT THEM IN JAIL AND KEEP THEM THERE!!!!! These people know the courts are NOT going to do anything to them! Are Jordan Larson and Scott Larson married, brother and sister living together or cousins with the last name? I’m curious if they’re living an incestuous lifestyle or a legitimate couple. You know why Utahans have family reunions, don’t you? It’s to find a date and a mate.